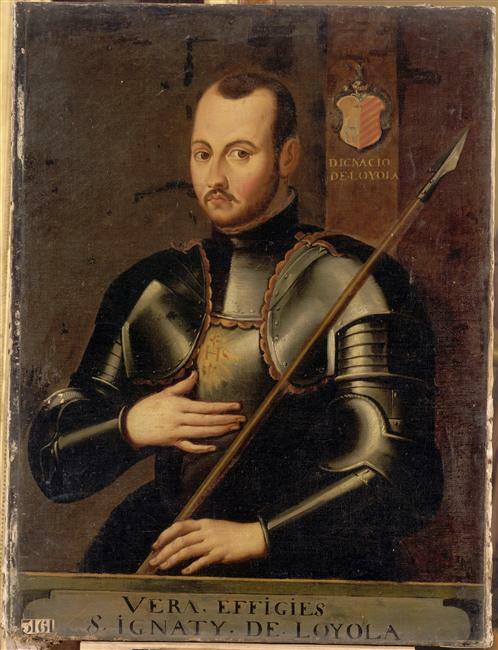 Inigo, as Ignatius was called in his early life, was born in 1491 into the noble family of Loyola in the Basque region of Spain. He was the youngest of thirteen children. His family was well known in the Basque country and had contacts with the Spanish nobility. In 1506 Inigo moved to Arevalo to serve as page in the household of Juan Velazquez, treasurer of the King. Here he began his training to become a courtier or member of the king’s court. His ambition and dream were to become a distinguished soldier in the service of the king and to win earthly glory. However, Inigo’s dreams were shattered at the age of 30. In May 1521, the French army attacked the fortress of Pamplona. The Spanish defenders were outnumbered and the Spanish commander wanted to surrender. But Inigo convinced him to fight on for the honor of Spain, if not for victory. During the battle, a cannon ball hit Inigo, shattering a leg. However, the French admired his courage. He was carried back to the castle of Loyola. At Loyola Inigo underwent an operation to set his leg right. As the leg did not set properly, he underwent a second operation, all without anesthesia. But healing was slow. At one stage his condition became worse, and he was told by the doctors to prepare himself for death. Then, on the feast of Saints Peter and Paul (29 June), he took a miraculous and unexpected turn for the better and began to recover. During the long weeks of his recuperation, Inigo was extremely bored and asked for some romantic novels to read in order to pass the time. But there were no such books at the castle of Loyola. There was a copy of the Life of Christ and a book on the Lives of Saints. Inigo did not like them, but desperate to pass the time he began to read these books. The more he read, the more he began to like them. A strong desire to live like the saints filled his mind. At the same time he continued to have daydreams of fame and glory, along with fantasies of the court, He noticed, however, that after reading and thinking of the saints and Christ he was at peace and satisfied. He began to challenge himself. “If St. Francis and St. Dominic could do great things for God why not I?” he asked himself. “What have I done for Christ? This was the turning point in Inigo’s life. Henceforth he would abandon all dreams and plans for earthly conquests and honours. He would begin a new life in the service of God. He would not be satisfied with ordinary things. Rather, he would work only for the greater glory of God. When he had recovered enough to travel, Inigo left the castle of Loyola in March 1522. He went to Monserrat as a pilgrim. He spent a night in vigil and offered his knight’s sword to Our Lady. Then he exchanged his courier’s dress for that of a beggar. He stayed in a cave outside the town called Manresa, and remained there for ten months. He spent many hours each day in prayer and also worked in a hospital. He had some deep spiritual experiences. To make up for his past life of earthly glory he undertook many extreme penances, trying to outdo those he had read in the lives of the saints. He kept notes of his experiences in prayer. These notes became the basis of a small book known as the Spiritual Exercises. In 1523, Inigo went on a pilgrimage to the Holy Land via Rome and Venice. He wanted to live permanently in Jerusalem. But the authorities ordered him to leave the Holy Land. On his return to Spain he decided to become a priest. By now Inigo was 33 years old. But he needed to learn the Latin language in order to pursue his studies for the priesthood. Therefore he went to a school and sat with young boys to study Latin. He also enrolled himself as a student at the University first in Barcelona (1524-26) and then in Alcala (1526-27). Inigo was always eager to help people find their way to God. He would gather those who were interested and explain the Gospels to them. He would also teach them how to pray. This attracted the attention of the authorities who suspected the correctness of his teaching. He was imprisoned for some time and then declared innocent. In order to avoid further harassment, Inigo moved to Paris in 1528. At the University of Paris Inigo began his schooling again. He studied Latin grammar and literature, Philosophy and Theology. In Paris he shared a room with two other students, namely, Francis Xavier and Peter Faber. He also greatly influenced a few other fellow students. Under his direction, at one time or another, all of them went through a thirty days’ retreat or the Spiritual Exercises. Eventually six of them and Ignatius decided to form a group. They took the vows of chastity, poverty and to go to the Holy Land. However, because of the wars with the Muslims they could not go to Holy land. Instead, they went to Rome and placed themselves at the disposal of the Pope. In Rome, Inigo, now officially known as Ignatius, and his companions decided to form a community, with the Pope’s approval, in which they would vow obedience to a superior general who would hold office for life. They would place themselves at the disposal of the Holy Father to travel wherever he should wish to send them for whatever duties. A vow to this effect was added to the ordinary vows of poverty, chastity and obedience. Formal approval of this new Order was given by Pope Paul III on September 27, 1540. Since in Spanish they had referred to themselves as the Company of Jesus, in English their Order became known as the Society of Jesus. 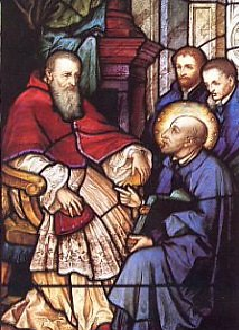 Ignatius was elected as the first superior. On the Friday of the Easter week, 22 April 1541, at the Church of St. Paul they pronounced their vows in the newly formed Order. Ever since his student days in Paris, Ignatius had suffered from stomach ailments and these became increasingly troublesome in Rome. In the summer of 1556 his health grew worse and on 31 July the same year he died. Thus the former worldly courtier and soldier, who had turned his gaze to another court and a different type of battle, rendered his soul into the hands of God. Ignatius was beatified on 27 July 1609 and canonized by Pope Gregory XV on 12 March 1622 together with St. Francis Xavier. Ignatius was never satisfied with ordinary things. He always wanted to improve his performance in anything he did. Magis, that is, ‘better’ and ‘greater’ was his motto. Ignatius never hesitated to face new situations and challenges, even when they were difficult. For him challenges were invitations for the magis, or excellence. Ignatius understood that new situations demanded choices, and that right choices determined a person’s character. In this Ignatius’ thinking was in tune with what Aristotle, the famous Greek philosopher said, “I am what I am today because of the choices I made yesterday.” The message of Ignatius for us today is: “Face the challenges, make the right choices, strive for excellence and become great, preferably greater”. For St Ignatius of Loyola God is creator and, Lord Supreme Goodness, the one reality that is absolute; all other reality comes from God and has value only in so far as it leads us to God. This God is present in our lives, “labouring for us” in all things; he can be discovered, through faith, in all natural and human events, in history as a whole, and most specially within the lived experience of each individual person. Jesuit education acknowledges God as the Author of all reality, all truth and all knowledge. 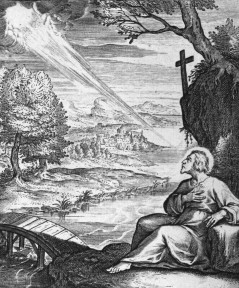 Education in a Jesuit school tries to create a sense of wonder and mystery in learning about God’s creation. It also aims at transformation in four areas. They are The Four Pillars of Jesuit Education. “Today our primary educational objective must be to form men and women for others; men and women who will live not for themselves, but for God…………; men and women who cannot even conceive of the love of God which does not include love for the least of the neighbours; men and women completely convinced that the love of God which does not issue in justice for men and women is a farce”. Such an education that is envisaged is one of the challenges of our time. Communal conflict, discrimination, fundamentalism and now materialism have taken a stranglehold on the minds of our people. Education has often not been able to change the mindset of people. Yet, can we do better so that the evils of our time dwindle and disappear? In the light of this objective, we focus on certain issues. All things being equal, we look for teachers from our preferential groups to impart an education that is keeping with our vision. Organizing regular service programmes that require exposure of our students to the poor and needy, to human suffering and injustice, reflection being an integral part such programmes so as to facilitate the internalization of learning experience. Inculcating an understanding of gender issues, human rights violations, the evils of communalism and ecological depredation. “ Jesuit education includes formation of values, in attitudes and in an ability to evaluate criteria; that is, it includes formation of the will. Since knowledge of good and evil, and of the hierarchy of relative goods, is necessary both for the recognition of the different influences that effect freedom and for the exercise of freedom, education must take place in a moral context; knowledge is joined to virtue. Enabling them to become free from social conditioning so as to develop into responsible persons capable of making free choices and acting out of conviction In a given situation. Nurturing a Christian culture that is rooted in trust, authentic relationships, service of all, inclusiveness, forgiveness, and is therefore counter-cultural to the present trends. Training students in discernment so that they learn to listen to and discover God’s will in their own lives, read the word active in their conditions and contexts and so open themselves to the transcendent in the situations and circumstances of their lives. Educating students in the tenets of different faiths and through dialogue of life and action, cultivate an appreciation and understanding of faiths other than their own whilst they remain rooted in their own faith. Motivating students to live lives of integrity in spite of corruption all around. 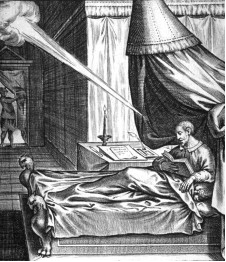 A thorough and sound intellectual formation includes mastery of basic humanities and scientific discipline through careful and sustained study that is based on competent and well-motivated teaching…… in Jesuit education, particular care is given to the development of the imaginative, the affective, and the creative dimension of each student in all course of study. Introducing right brain activities that develop the creative abilities and affective dimension of our students. Training students to think reflectively, logically and critically… to be active learners rather than passive spectators. Initiating programmes for self-directed learning that will arouse the intellectual curiosity of students and enable them to appreciate the pleasure of personal research so that they can deal with new situations in their personal and professional lives. Promoting a culture of life in the school so that students learn to handle stress situations effectively and adopt healthy life styles. “The objective of Jesuit education is to assist in the fullest possible development of all the God-given talents of each individual person as a member of the human community. Having a common minimum programme of participation in various co-curricular activities resulting in students discovering their talents and enhancing them by putting them at the service of the community. Adopting programme in our schools that make for personal and social transformation e. g. yoga, meditation, CLC etc. Giving students the freedom to think feel, judge and imagine so that they remain in control of their lives. Accordingly high priority to programmes that promote student interaction with each other and live-ins as to develop friendships and cooperation across borders.